1. Score striped paper from left to right, 5 1/8" then 1/4" from the first score line, then 5 1/8" from that score line and then 1/4" from the last score line. 2. 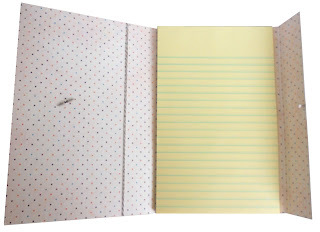 Adhere notepad in place inside of folded paper as shown in image below. 3. Score orange dot strip as follows: 3/4" from edge, then 1/4" from first score line, then 3/4" from that score line and 1/4" from that score line and repeat. Then fold to look like pleat. 4. Cut pleated piece so there is a 4" and 2" (approx.) pieces. Adhere 4" piece flush with top edge about 3/4" from left edge. Adhere smaller piece flush with bottom edge. 5. Wrap doubled twine around front flap and tie in bow at bottom of book. 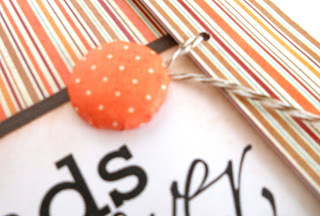 Tie pompom pied around bow. 6. 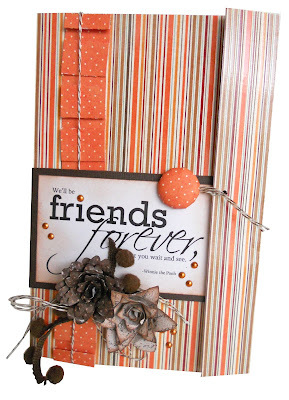 Trim around "Friends Forever" quote, ink edges and mount to brown cardstock and mount 1 3/4" from bottom edge and flush with the left edge of book using brown foam tape. 7. 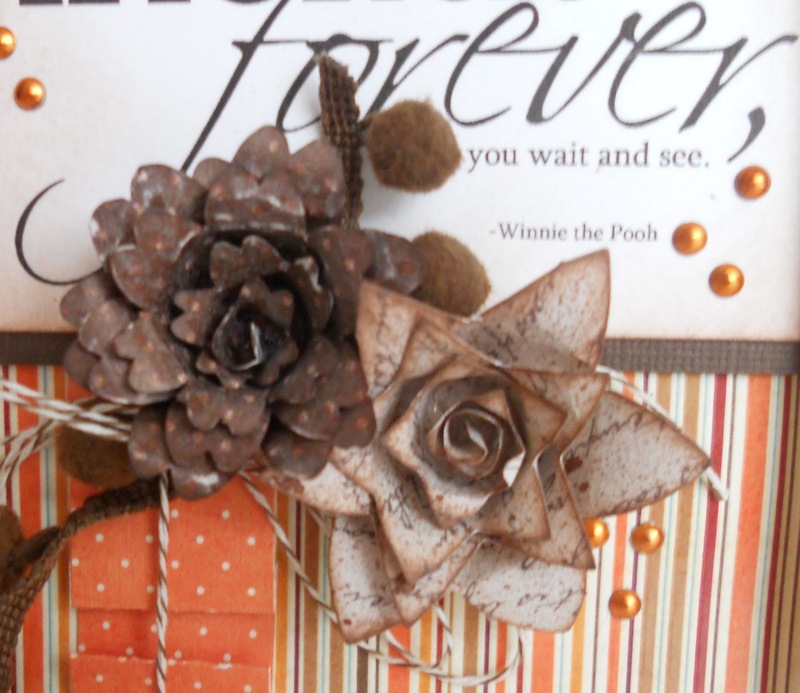 Create Roly Rosie flowers and adhere to book as shown. 8. Use i-top Tool to create orange covered medium brad and mount 1 3/4" from right edge and 3 1/2" from top edge. 9. 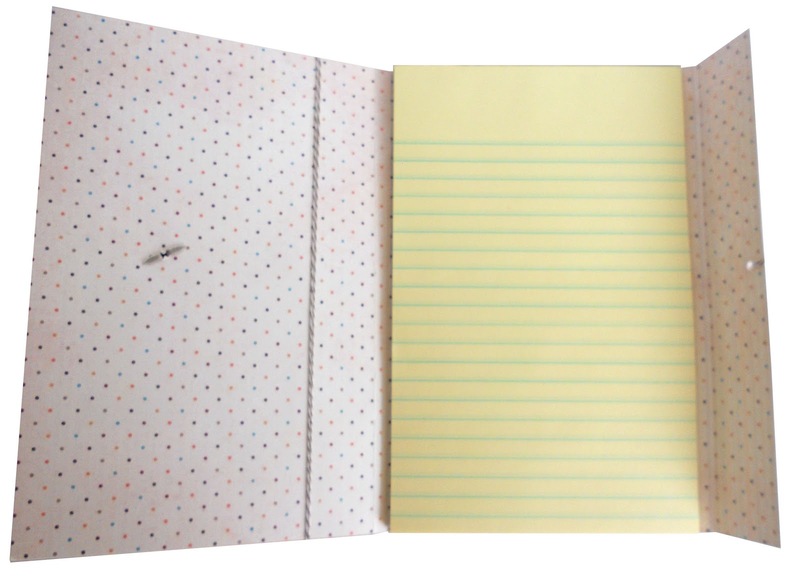 Punch small hole in center of small flap and tie small piece of twine through hole. 10. Use i-rock and copper bling to add accents to project. cute cute cute!!!! its just fab, thanks for the tutorial!